Three oil sponsorship actions in just over 48 hours! Accompanying photo by BP or not BP? Last week, three Art Not Oil groups carried out three different creative interventions against oil sponsorship of arts and culture in just over 48 hours - and a fourth group held a powerful artistic event the following day. Firstly, at 1pm on Thursday November 24th, campaigners from Platform held a surprise silent vigil for Egyptian political prisoners in front of a packed-out audience in the British Museum's BP lecture theatre. The vigil took place just before a talk about the BP-sponsored "Sunken Cities" exhibition, featuring objects from Egypt - where BP continues to support the brutal military regime. Flyers were distributed to the audience, and at the end of the vigil the room burst into applause. Read the full story here. Then, on the evening of Friday November 25th, activist-performers from BP or not BP? Scotland gatecrashed the "Friends Preview" of the Scottish leg of the BP Portrait Awards. They spoke to the public outside and made an unexpected speech challenging BP inside the event itself. See here for photos and more information. Next, on Saturday November 26th, BP or not BP? took over the British Museum for the whole afternoon with a "rebel ceremony" to mark the end of the BP-sponsored Sunken Cities exhibition. 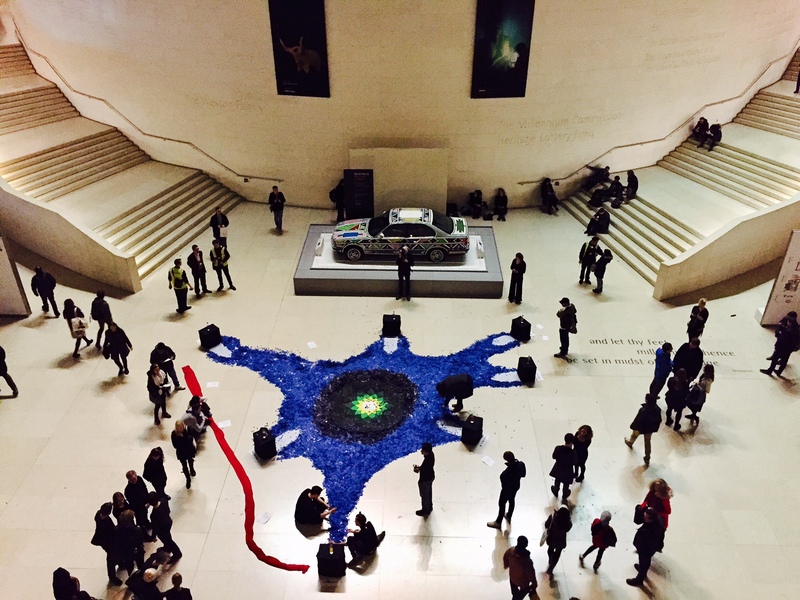 The performance included a giant BP logo which slowly "flooded" the Great Court throughout the day, and a series of mobile performances featuring testimony, stories, poems and films from seven global cities at risk of rising seas. Full story here, photo album here. Finally, on Sunday November 27th, Liberate Tate held a special event to reunite performers who had taken part in "Birthmark", their tattoo-based intervention that has been held at a number of different locations over the last year. Some powerful images from the photoshoot of the day can be found here.